When was the last time you tested out the way you deliver services to your business? Think about that for a moment. You might be quick to respond by saying that you are doing pretty well. The key is really being able to quantify the level of success so that you can build an improvement strategy. You might want to consider testing yourself to see just how well you are doing. How would you stack up in in situations that were outside the ‘normal’ circumstances? Is there a continuity plan for IT in place? Is IT prepared to ensure that services continue in the event of some sort of unforeseen disruption? Are they aligned with some form of business continuity plan? The first test should be to see how we would handle such an interruption and identify where gaps may exist. Performing these drills or tests where appropriate allows us as an IT organization to ensure we know what to do in the event of an emergency and where some adjustments to our plan could be made. Just like a fire drill. When you are in the day to day you may not see what’s really going on. Suppose you had the Change manager review the Service desk process and the Service desk manager review change. It is likely that each other would have questions on why certain things are done the way that they are and some gaps may be found in the process. Also this gives you a chance to not only learn about what each other does but get a better sense of the overall delivery of service you are providing. Do you regularly review with your customers, whether internal or external? Do you know how well you are doing or if there are any areas for improvement? I have said it before and I will say it again, IT and the business can have very different perceptions when it comes to how efficiently service is being provided. If we, as an IT organization, leverage our own measures only we can only see half the picture. On one hand you might perform some review on “how you are doing” on the other hand if the reviewer is internal are they being as objective as they can possible be? It is easy to solicit feedback when you are NOT providing a good customer experience. Unfortunately we are more likely to get complaints rather than compliments however when we are at the bottom we get loads of valuable feedback. On the flip side when we provide adequate service we are less likely to get voluntary feedback. To test out our performance we should be talking with our customers on validate what is working well, and what needs some improvement. Remember it's possible that there may be issues with services which we are not even aware of. Due to your organizational culture they may have never even been escalated to the service desk before. Think of these tests in terms of the analogy of a frog in a warm pot of water. 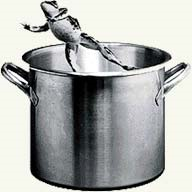 You can turn up the heat on the stove and after a while the frog may jump out of the pot when it get too hot. In other cases it may not jump out in time and may get boiled before it has time to react. Please feel free to share your tests with me as well!